Last summer I told you about my Social Media Experiment to bring Anthony Bourdain and the TV show No Reservations to Orlando. Just like last time when I told you about my campaign (read it here if you missed the post), I’ve tried to write an update about four times. Every time I’d start to write, something else would happen. 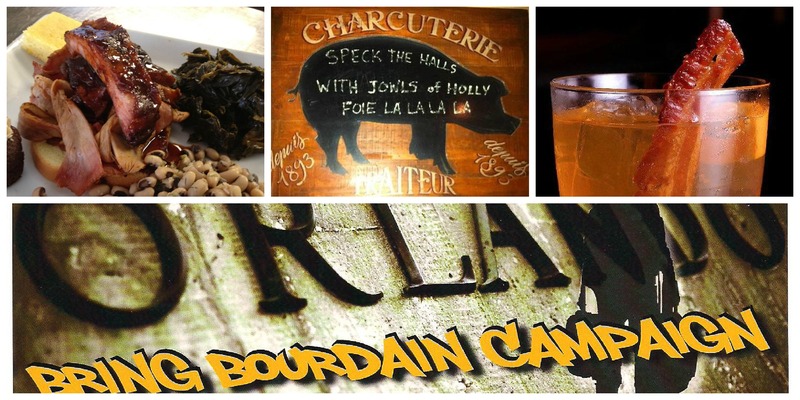 In November, they aired the LAST episode of No Reservations on The Travel Channel. 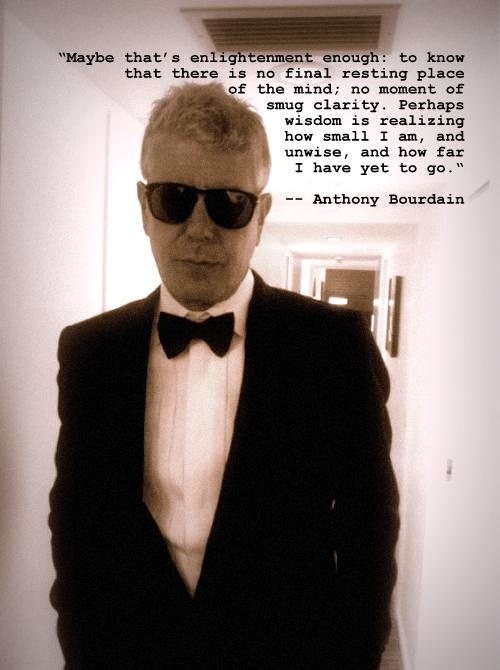 It was sad to see such a great show end but I know it doesn’t mean we’ve seen the last of Bourdain on our TV screens. His show will be moving over to CNN and from what we can tell, it’s still a travel-based format. So we continued to pull the final pitch together with the help of a graphic artist who volunteered her time. Then I get this message from the people on my team: This isn’t edgy enough, we need to re-work this. Big sigh from me and then an ‘alrighty then, let’s re-do this.’ There were meetings and many emails going back and forth. We had the copy written for the pitch but now we had to re-work the design layout to make it more edgi-er so they’ll notice us. And then I see a post from Bourdain himself on Tumblr. Or maybe it was Twitter, I’m not sure. I’m following him but not in a stalker weird kind of way. More to keep updated on what’s going on with his new CNN show and OK, I admit it, I like reading his blog posts and tweets. He’s pretty damn funny. The post had a video connected to it where it showed a promo for the new CNN show. It talked about the undiscovered world that he’ll travel to in the new series. I’m thinking – CRAP, I’m not sure we could classify Orlando as an undiscovered part of the world! Somewhere in the middle of this thinking and re-thinking, I was contacted by the producer who handles Bourdain’s book tour. He asked me if our Campaign to Bring Bourdain to Orlando fan page was for real. He wanted to know if he brought the book tour to Orlando, would people buy tickets. Are you kidding me? I did a post to all the fans and immediately they replied back with a loud YES as well as several other colorful words to describe how badly we want to see the man in person. And then it happened, we got the news that Orlando was included in the book tour lineup. Bourdain is coming to Orlando and our fan page brought him here. And then I got an idea, An awful idea! I GOT A WONDERFUL, AWFUL IDEA! We’re ditching the formal pitch and sending him a personal invitation to check out our town when he’s here for the book tour in Orlando. Take a look at the draft of the letter and let me know what you think. It’s gonna happens folks and we’re in for one hell of a party! We had started a grassroots effort to bring your new CNN TV show to Orlando. We know we have something special brewing in our town, something that goes beyond the pixie dust. And then, like the rest of the world, we saw the sneak peek of your new show promoting that you’ll be traveling to Parts Unknown. We realize Orlando is not somewhere in a galaxy far far away but we have a growing culinary explosion happening and its something we think loyal Bourdain fans would like to know about. So with this in mind, we’d like to extend to you an invitation to embark on a social media experiment with Orlando. We’re offering you the opportunity to come to Orlando, eat in our restaurants, discover what makes our city unique and find out for yourself why we really should have been a part of your last season of No Reservations. Then write about it in your blog. Bring a camera with you and document your experience to add to your YourTube page. Come on and experience tasting a new town without the restrictions of the network corporate rules. Say what you want, do what you do best. And we’re not concerned about monitoring what you say either. Those of us who have lived here in the Orlando area know about the local restaurants/chefs who have made this town their home. We have a growing food truck community who are experimenting with their own unique fusions of flavor that represent our own Orlando culture. 4 Rivers – Known for its line that tips the 45-minute waiting mark and owned by Chef John Rivers, 4 Rivers pushes beef and “deregionalized” barbecue to the forefront in a pork-dominated market by selling more than 30,000 lbs. of beef (predominately brisket) each week. Vietnam town – No one knows just how long the Vietnamese community has been in Downtown Orlando but these little mom-and-pop shops have brought their culture and authentic Vietnamese signature dishes. Food trucks – The food truck scene in Orlando has now reached an astonishing 40+ trucks. You can get anything from Seared Georgia Venison Flatbread with Wild Mushrooms and Fiddlehead Ferns from Big Wheel truck to A Grilled Cheese with Butterkase Cheese, Cranberry-Jalapeno Spread and Prosciutto on Brioche from Gastro-Truck’s to The Dolce Gabban: a classic vanilla cake soaked with heavy cream, evaporated milk, and condensed milk, then topped with Dulce de Leche frosting, sprinkled with cinnamon with a “red hot” smack dab in the center from the The Yum Yum Truck. If you haven’t joined our Campaign to Bring Bourdain to Orlando Facebook page, click here to LIKE us and follow our journey. Awesome! It pays to be persistent. Some days, my persistent ways are the only thing pushing me through. It’s a personality trait that cane be good or bad depending on what I’m dealing with. I never heard of this guy other than through your blog posts. I am sorry to have to be the one to tell you this. However, it is better to hear it from your blogger friend. It does sound a little stalkerish. I can see your point if you see the whole thing together like this. I’ve been working this thing for almost two years – it started out to see if a FB page could get a famous guy to our town and then it turned into creating this community of foodies who wanted the world to see how cool Orlando’s food culture is. It makes me see how important social media is to our business, our blogs, whatever we want to share with others. It really helps get the word out to people about some cool stuff we’re doing. I hope youdid not see that as disrespectful. I think it’s cool that you managed to accomplish getting this guy to come to your town via your campaign. No … not at all! You should know me by now, takes a lot to rattle me. I am taking that as a compliment! And you should! So don’t ever feel like you can’t tell me what’s on your mind about the stuff here. It’s good for me to get another point of view. YOu hae an excellent attitudent. I’d like to think I am as open to feedback as you – but sometimes I am not. I’m not always this excellent but I’m working on it.